“The incredible edible egg!” Remember this slogan from the 1970’s? For 70 or so calories you get high quality protein and a delicious nutrient dense food. I love eggs and this recipe is one of my favorite combinations. In the fall, at a class with Sheryl Julian (of the Boston Globe), I learned how to make and photograph this flavorful dish. It is easy and a great dish as an appetizer for a crowd or just for breakfast. The flavor combination of olive oil and butter are the key to this egg dish. 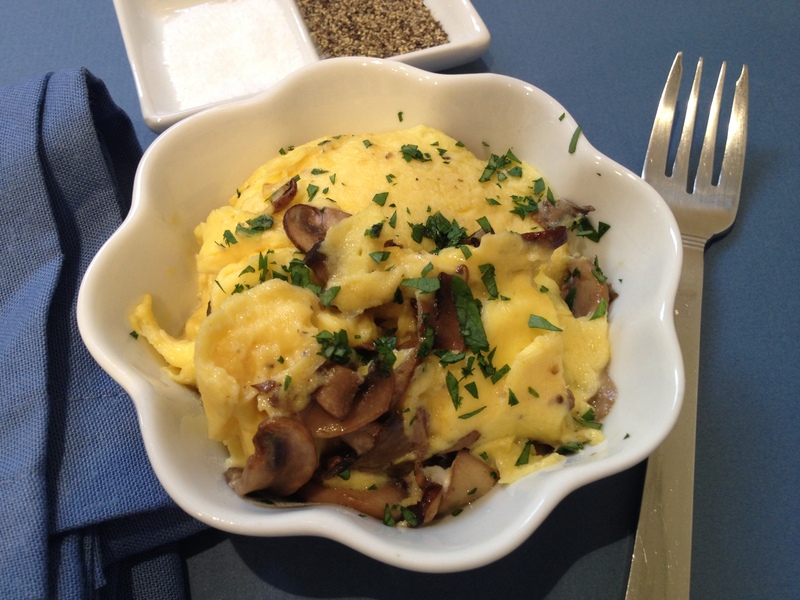 It is important to cook the mushrooms first, clean the pan and then cook the eggs. Heat 1 tablespoon of olive oil in a non-stick, 8-inch skillet over medium heat, when the pan is hot add 1 tablespoon of butter. Swirl the pan and add the mushrooms, salt and pepper. Cook, stirring often, for 5 minutes or until the mushrooms release their liquid. Turn up the heat and cook, stirring often, for another 5 minutes until the liquid evaporates. Stir in half the parsley and use a rubber spatula to transfer the mixture to the bowl. Wipe out the pan and clean the spatula. Set the pan over medium heat. Add the remaining olive oil and butter. Swirl the pan and pour in the eggs. Use the spatula to scrape the edges of the eggs into the middle and continue to scramble like this, until the egg mixture is soft but not quite set. Add the mushrooms and gently fold them into the egg mixture. Divide the eggs among 4 ramekins and sprinkle with the remaining parley. The combination of olive oil and butter is perfect. I so enjoyed my omelet! !